A vast kingdom called Lucifenia, whose popular name was the "Kingdom of Yellow", was ruled by a tyrannical fourteen year-old princess named Riliane. Under her absolute monarchism, everything was exploited from people and the ones who did not obey her were executed without mercy. Allen, a servant who looked a lot like her, was always beside the princess whom Lucifenia's people called the "The Daughter of Evil". The princess and the servant were the same age, since the two of them were actually twins who were separated in a political dispute, with Riliane taking her mother's position as the country's ruler and Allen works in the palace as a servant since he was pronounced dead and given up for adoption. The princess's selfishness and jealousy caused a war and many deaths, and their secret clockwork of fate was going to spin madly. 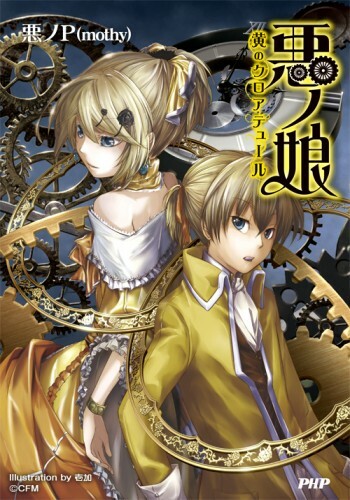 the novel is based on a series of VOCALOID songs, but the storyline is some what different from the songs. This novel is based on my favorite Vocaloid song, and when i watch the other 6 songs together with it has sort of a musical anime on youtube, I realize this story would make a very dark and Awesome Anime or light novel, plus its not an Isekai. Although I know Sam said Miku's people were kind of hard to negation with on curious cat, since they have the licensing rights, but I figure it has a better shot than some other titles I want from a certain publisher. Gotta upvote this as the Evil song series is my favorite Vocaloid song series ever. They have such a power behind their lyrics it's hard to not love them. I'm a personal fan of this and I did attempt to follow up an official license last year. Unfortunately I hit a dead end, so I don't really know if this is on the table, sadly. Spotlight time! A friendly bump to an older post that hasn't had any recent conversation and is lower on votes in order to draw attention to it.